This morning, George David's American Maxi, Rambler 88 was approaching the exit of the Strait of Messina, leading the 111 yacht fleet. Over night, Rambler 88 passed Lloyd Thornburg's American MOD 70 Trimaran, Phaedo3, which chose an offshore line having reached Capo Passero. Rambler 88 stayed inshore and made a gain of over ten miles. 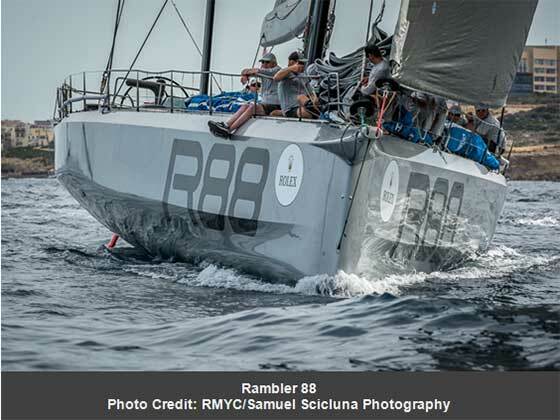 Rambler 88's nearest monohull rival was Jan-Henrik Kisteit's German Maxi 72, Momo, 14 miles astern. 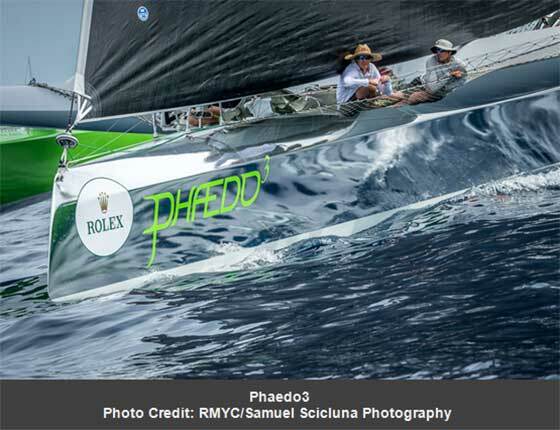 Phaedo3 held onto the multihull lead on the water, 10 miles ahead of Peter Aschenbrenner's American 63' trimaran, Paradox. This morning 82 yachts had passed Capo Passero and were negotiating a tricky passage along the east coast of Sicily. Whilst the super light conditions require little in the way of physical work, the concentration required is mentally exhausting. The teams that perform well in the slow conditions will reap the rewards. "Happily the wind has been mostly co-operating through a zone we figured would bring us nothing." commented America's Cup sailor, Mark Newbrook, from on board Rambler 88. "We've had some big shifts and a couple of holes but the breeze quickly returns and keeps Rambler moving along at a modest yet acceptable pace. We're sailing by Catania right now (0100 local time) on a northerly with our masthead zero up. As of now, I'd guess that we've sailed 90% of the race with the masthead zero upwind.The zero on Rambler measures 740 square meters (~7400 sq ft) and is an amazingly versatile sail that takes us upwind in light air, reaches in moderate air and runs in light air; it gets a lot of use. As I type this the wind just built a little and we're fully powered up in just nine knots of wind. It's pretty warm out here tonight; jackets are optional.We expect to see the glowing lava flows of Mount Etna before sunrise, which we are looking forward to. Once again, we're expecting the breeze to drop, as we approach the Strait of Messina - We'll see." Whilst the powerful, high performance yachts have pulled away from the fleet, the overall winner of the Rolex Middle Sea Race is decided by time correction for the yachts racing in the six IRC classes. By 0800 CET, the bulk of the fleet had passed Capo Passero, giving a precise reference point to make the time handicap calculation. 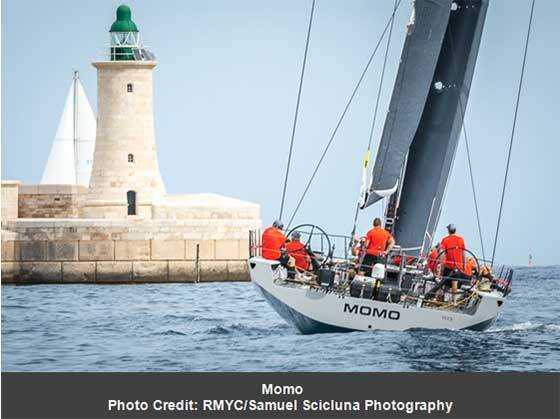 The leader of the fleet at Cap Passero was Maxi 72, Momo with 2012 race winner, Michele Galli's Italian TP52 B2 second. Swiss Botin 65, Caro, sailed by Maximilian Klink was in third place and Hungarian RP60, Wild Joe, sailed by Marton Jozsa was fourth. Other yachts well placed at Capo Passero include: Vincenzo Onorato's Italian Cookson 50, Mascalzone Latino and Bill Coates Texan Ker 43, Otra Vez, both are racing in IRC Two. In IRC Three, David Collins British Swan 45, Tala was the class leader from Turkish Ker 40, Arkas Flying Box, skippered by Serhat Altay. Bastiaan de Voogd's Dutch Sydney 43, Coin Coin was third. Tala's navigator, William Broughton, contacted the Rolex Middle Sea Race media team last night. "Light airs meaning tactical headaches. Wind shifts of 50 degrees in 3 seconds! But still trucking along. Lots of ideas and calls for sail changes only to wait for the 5 minute rule, and they're cancelled! Our helm noticed we picked up a lobster pot, after a back down it still wasn't clear off the keel, so Gregory our hero quickly got undressed, put on the goggles and dived into the pitch black, within 5 seconds he resurfaced and gave the all clear and was back on deck. Free from the lobster pot, we started making the numbers much better! Lots of onboard debate over the rugby scores with Kiwis Aussies Springboks and Welsh onboard!" In IRC Four, three Xp-44 yachts were top of the leader board at Capo Passero, including two Maltese yachts. Josef Schultheis and Timmy Camillieri's Maltese XP-ACT Bank Sails held a narrow lead over Vikesha II, skippered by Oleg Evdokimenko and sailed by a crew all from the Czech Republic. David Pizzuto's Maltese Xpedite was third. In IRC Five, Maltese J/122 Artie, co-skippered by Lee Satariano and Christian Ripard was the class leader from Costantin Manuele's Italian First 40.7, Canevel Spumanti. Laurant Charmy's French J/111, SL Energies Groupe Fastwave was third. 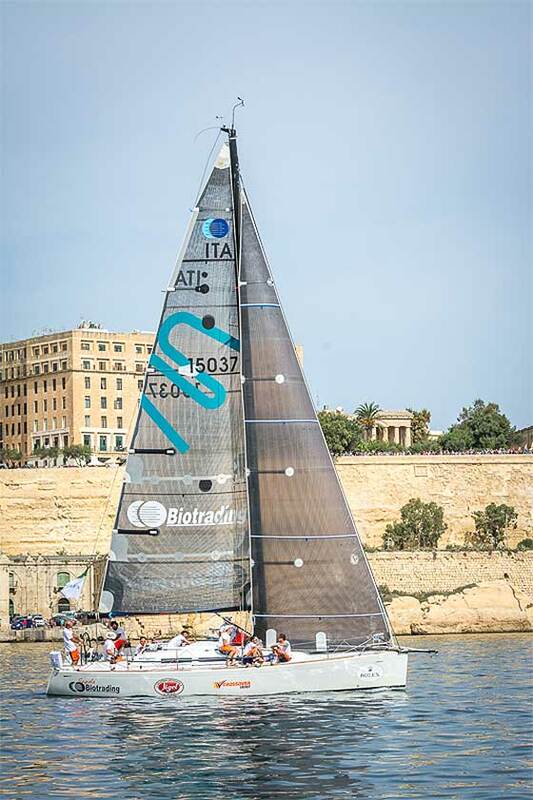 Jamie Sammut's Maltese Solaris 42, Unica was fourth. In IRC Six, Peppe Fornich's Italian Grand Soleil 37, Sagola-Biotrading, was the leader at Capo Passero. Bristish Double-Handed team, James and Simon Sweetman were second in class racing First 40.7, Sweet Emily and Milan Hajek's team from the Czech Republic, racing First 40.7, Three Sisters was third. In the Double Handed Class, Paolo Semeraro's Italian Neo 400, Neo Double Banks Sails Racing, was leading at Capo Passero with Italian Rolex Middle Sea Race veteran, Beppe Bisotto placed second racing Atame. Croatian Class 40, Waypoint, skippered by Damir Chargo is third. The Class 40 division was led by Cristiano Verardo racing Italian entry, Kika Green Challenge. A further update will be posted on the official Rolex Middle Sea web site this afternoon. To follow the race, visit the official Rolex Middle Sea Race web site. Competitors are encouraged to contact the media team during the race with stories from the sea, pictures and even videos.